The Sooner State was shaken by 585 quakes of magnitude 3 and larger, compared with only 100 in 2013, according to an EnergyWire analysis of federal earthquake data. California, which is twice the size of Oklahoma, had fewer than one-third that number. Researchers and many people in the state believe the quakes are linked to oil and gas activity, namely deep-underground disposal of drilling waste fluid. "Who'd have ever thought we'd start having so many earthquakes out here in the middle of the country?" asked Max Hess, a county commissioner in Grant County, which had about 150 quakes last year. He also thinks the quakes are related to oil and gas, which has been an economic boon for the rural county northwest of Oklahoma City. "It's been good," Hess said of the drilling, "but it's got its drawbacks." But many in Oklahoma, where 1 out of every 6 jobs is linked to oil and gas, have been slow to embrace a connection, even as the pace of earthquakes has picked up and complaints have grown louder. "I think a lot of it has to do with the drought," said fellow Grant County Commissioner Cindy Bobbitt, "with maybe the disposal mixed in." The link between earthquakes and drilling in Oklahoma has been actively discussed since at least November 2011, when the state was hit by its largest recorded quake. Centered near Prague, the magnitude-5.7 rupture injured two people and damaged more than 200 homes and businesses. 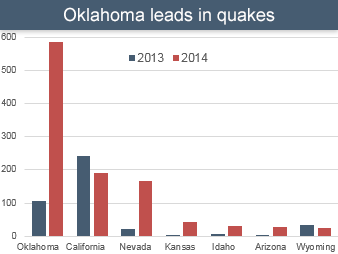 Oklahoma had more earthquakes last year than any other state in the Lower 48. Data courtesy of the U.S. Geological Survey. In May, the Oklahoma Geological Survey and USGS said the spike in the number of earthquakes meant it was much more likely that the state could suffer a damaging earthquake of magnitude 5.5 or greater (EnergyWire, May 6, 2014). The joint announcement said deep injection of wastewater was a "likely contributing factor." The Oklahoma Corporation Commission, which oversees oil and gas in the state, last year adopted what it calls the "traffic light" approach. Disposal wells in a swarm area within 6 miles of the center of a quake of magnitude 4 or greater are put in "yellow light" status. They get special scrutiny. The commission has temporarily shut down at least six disposal wells so they can be brought back into compliance. EnergyWire's review of earthquake data looked at onshore earthquakes of magnitude 3 or greater, because that is the strength at which most earthquakes in the United States can be felt and reliably recorded. There are more seismic monitors on the East and West coasts, so many smaller earthquakes are recorded in those areas. The review indicates that Oklahoma's seismic action has been spreading north into Kansas, which had only two earthquakes in 2013 but 44 in 2014. Most were near the Oklahoma border. The number of quakes also jumped in Colorado, where a disposal well was temporarily shut down in 2014 after an earthquake. In Texas, where scientists have also linked quakes to drilling, earthquakes declined last year. Scientists generally judge Alaska separately. Alaska had more than 2,600 quakes last year, more than all other states combined. In Oklahoma, 15 of the quakes were magnitude 4 or greater, the strength at which experts say significant damage can occur. Bobbitt, the Grant County commissioner, said people in her rural county talk a lot about the earthquakes but take them in stride. After all, they're less destructive than tornadoes, and if they are related to oil and gas, the drilling boom is bringing in money and jobs. "I can count on one hand the number of people who have called me" about earthquakes, Bobbitt said. "You get a little income from something and you're more OK with it." Closer to Oklahoma City, state Rep. Jason Murphey said his constituents are more rattled by the shaking. He's a Republican from Guthrie, north of the city along Interstate 35. "You start seeing the emails come in when you get to the 4.0 range," said Murphey, who hosted a contentious town hall meeting on quakes in June (EnergyWire, June 27, 2014). "Some are worried there'll be a really big one. Others are mad about a crack in their wall." But others in the area take it in stride, too, if the remarks on the Guthrie News Page on Facebook are any guide. "It's almost becoming routine," one commenter said after an early morning quake on Dec. 28. "Our family only brings it up any more if it is a particularly strong one. Ho-hum." Clarification: The U.S. Geological Survey has updated its count of earthquakes in Oklahoma of magnitude 3.0 or greater. Prior to the original publication of this story, USGS data showed there had been 564 such earthquakes in Oklahoma in 2014. The data now show 585. In addition, EnergyWire is clarifying the number of earthquakes ascribed to California in 2014. This story originally included quakes centered offshore in the Pacific Ocean, indicating Oklahoma had only twice as many earthquakes as California. Counting only onshore earthquakes, Oklahoma had more than three times the number of earthquakes (magnitude 3.0 or greater) as California.